China and Russia are teaming up for a joint uranium mining project in Western Russia. The ARMZ Uranium holding subsidiary of Russian state owned energy giant Rosatom will be partnering with the Russia-China Investment fund (RCIF) on the $325 million project in the Zabaikalsky region. The Priargunsky Industrial Mining and Chemical Union will reportedly own 51% of the new project, while ARMZ will hold the remaining 49%. The majority of the financing will come from the China National Nuclear Corporation with a $282 million investment, while the RCIF will put up the rest. The mine has a total reported reserves of 40,000 tons of uranium ore, with an annual capacity of 850,000 tons expected - and will break ground by 2023. China is the first foreign country allowed to invest in Russian uranium mining, which the Kremlin has been aggressively pursuing as part of a "uranium dominance strategy" uncovered by undercover FBI whistleblower William D. Campbell, who supplied the agency with information from the highest levels of Russia's nuclear industry. 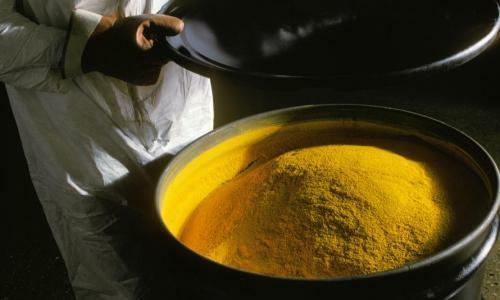 The strategy included the purchase of Canadian-based Uranium One, which gave the Kremlin rights to 20% of American yellowcake uranium. Campbell, despite being severely ill with cancer, testified before Congress about his undercover work - telling them of a scheme to route millions of dollars to the Clinton Global Initiative (CGI) through lobbying firm APCO, which was expected to funnel a portion of its annual $3 million lobbying fee to the charity. Meanwhile, Russia's Rosatom expects to sign foreign contracts worth $26 billion in 2018 for the construction and maintenance of nuclear power plants in India, Iran, Egypt, China and several other countries - including 16 plants in Saudi Arabia.